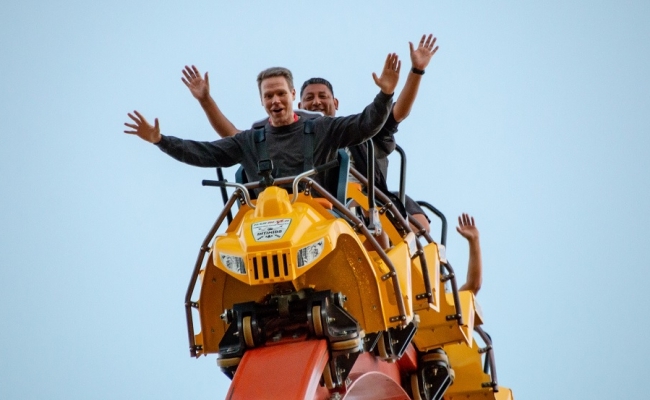 California’s Great America opens for the 2019 season on March 23, but for ACE members, the season typically kicks off much earlier than that. Such was the case on March 9, when Great America hosted ACE for the seventh annual behind-the-scenes tour, where members got the chance to not only check out the ongoing improvements, but get the scoop on upcoming shows and activities slated for this year. And of course, what has become a tradition of the tour, those who were brave enough had the opportunity to take the dive on Xtreme Skyflyer, some more than once. 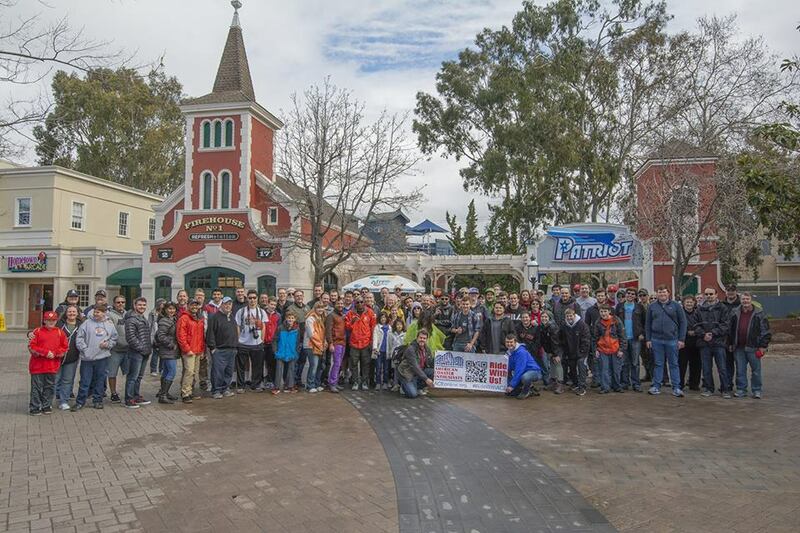 While attendance didn’t quite reach last year’s record-setting 139 people, perhaps due to the light rain that sprinkled throughout the early part of the tour, it still came close when 128 walked through the Great America Pavilion’s gates on March 9. According to ACE NorCal Regional Representative Nicholas Laschkewitsch, 83 of those in attendance were members, and the other 45 were guests. Some also joined ACE specifically for this event. After being treated to sweets provided by the park in the Pavilion, Great America’s Danny Messinger led ACE on a tour throughout the park. Continuing the work from last season, Great America is replacing midways in multiple sections of the park, including a brick overlay at the park’s entrance, as well as tearing out the remaining asphalt walkways at Orleans Place and replacing it with pavers. Messinger also announced that Great America’s in-house artist Lacey Bryant will be restoring the horses for Carousel Columbia in what is expected to be a multi-year process. Fans will get to see this work first-hand and ask questions, as Bryant will be working on the horses in an area near Gold Striker Gifts. Keeping up with the restoration theme, Drop Tower is sporting a new green-and-brown paint job this season, meant to be a nod to California’s sequoia and redwood trees. A new sign on the midway is also in the works, and Great America gave ACE the opportunity to vote on a design out of a series of four. The new theme of Drop Tower reflects the overall natural scenery look of that area of the park, which began when RailBlazer opened last year. A new event featuring live bands and barbecue food is also slated for the summer in the lawn area adjacent to RailBlazer. After being under construction for the majority of the 2018 season, French Quarter Funnel Cakes & Churros in Orleans Place will open this year. Hungry guests can choose a funnel cake or churro, and add their toppings of choice as they work their way down the line. The building has two entrances to help with crowd flow, and features a calming patio area of to the side for guests to enjoy their treats. Once the walking tour wrapped up, ACE members convened in the Great America Theater, where they tried their luck in a raffle that included prizes such as Fast Lane tickets, an anti-rollback mechanism for the former Logger’s Run (and other pieces of the ride), an original blueprint of an Arrow coaster train provided by S&S, RailBlazer water bottles and other items. This year, there were not one, not two, but three recipients of the Richard Tuck Spirit Awards: Mike Rumble of Inside CGA, and Assistant Regional Reps. Emi and Matthew Pearce. Rumble joined ACE in July 2017, and has contributed photography to ACE NorCal’s social media networks, ACE News and RollerCoaster! He has also created online advertisements and fliers for regional events. Rumble, who also manages Inside CGA, was major contributor to ACE’s recent “Path to RailBlazer” documentary released in December that has been seen nearly 15,000 times. Rumble said being with ACE has allowed him to be creative with his work and share it with a wide audience of fellow coaster enthusiasts. Emi and Matthew Pearce have been involved with ACE for nearly 20 years. They have donated thousands of dollars at the annual ACE NorCal Holiday Party, which was held at the now-closed Playland-Not-at-the-Beach. They have also made regular donations to the Playland Pals in support of the American Cancer Society and to the museum itself over the years. The two have also been Assistant Regional Representatives for ACE NorCal for nearly 10 years, and are responsible for planning ACE events at Six Flags Discovery Kingdom. A special thanks to California’s Great America for taking the time out of their busy schedules, especially in these hectic weeks leading up to the season opener, to show us the latest in the park. We appreciate the hospitality, and are even more excited for March 23. Erik Chalhoub is the Magazine Editor at New SV Media in Gilroy (and a roller coaster fanatic!). He is also the proud recipient of the 2016 ACE NorCal Richard Tuck Spirit Award.